"The need for Capacity Development arises in all fields of agri-food research, but is particularly pressing in new areas such as Data Management and Communication Technologies, Landscape analysis and Climate-smart agriculture". These issues, together with other CGIAR (Consultative Group on International Agricultural Research) strategic priorities for a food-secure future, are defined in the CGIAR Strategy & Results Framework (2016-2030). This entry will highlight several Capacity Development efforts that have been undertaken by some of the 15 CGIAR centers, through the existing CGIAR Research Programs (CRPs) making up the CGIAR Portfolio 2017-2022. 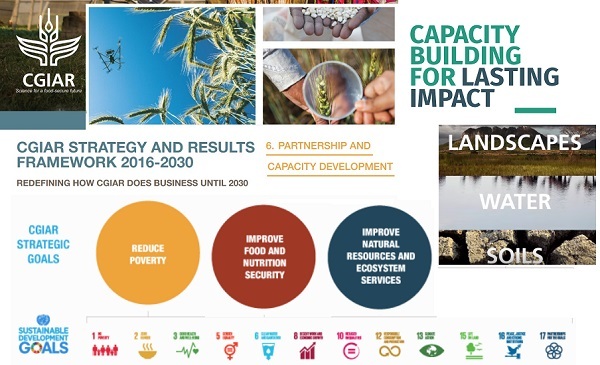 CGIAR’s 15 Research Centers implement collaborative large-scale CGIAR CRPs conducted in more than 60 countries with the support of over 10,000 world-class scientists and other staff, systematically contributing to CGIAR System Level Outcomes (SLOs) aligned with the Sustainable Development Goals (SDGs). CGIAR cross-cutting issues embrace : Climate change - Gender and youth - Policies and institutions - CAPACITY DEVELOPMENT (& monitoring, evaluation and learning as functions coordinated by specific Centers or Communities of Practice to ensure integration and coordination across the CGIAR Research Programs). Creating spaces for "learning by doing". Through Capacity Development (enabling, for example, a specific theme, to make it grow and to flourish) can be improved Organizational Policies, Designs, Strategies, Plans and Processes. In addition, Capacity Development can promote networking among individuals and organizations in order to improve synergies. CIAT leads the CGIAR Research Program on Climate Change, Agriculture and Food Security (CCAFS). CCAFS aims at providing a one-stop shop for data and knowledge generated by its research activities. The program is mandated to produce international public goods (here: high quality open data outputs) that are freely accessible to the global community.. CIAT has developed a Data Management Strategy for its researchers and partners to enable them fulfill these obligations, while at the same time enabling a variety of data management procedures and good practices at project level. Much of this process is being guided by the CCAFS Data Management Support Pack. WHEAT (to raise the productivity of wheat in developing countries). In addition, CIMMYT has taken on a convening role in developing the aforementioned CGIAR Research Support Platforms. Besides, CIMMYT is maintaining CIMMYT institutional network of scientific datasets and software repositories and Publication Repository, helping also to achieve compliance with common agreements (on Big Data , Open access, Open Data), and processes. Involve graduate students, postdoctoral Fellows and Visiting Scientists in cutting-edge, impact-oriented research, hands-on and highly specialized (online MOODLE) courses, workshops, visiting scientist appointments and field days. These events can last from one day to an entire year. for extension and development agencies to bring the knowledge to practical use and application. Find out more about a highly variegated ICRAF’s Capacity Development Programme. ICRAF’s Resources Online contain ToolKits, Publications, Success Stories, Databases, Datasets, Concept Notes, Models… on support of Capacity Development. Bioversity International is a global research-for-development organization, which has a vision (supported by its huge Research portfolio) – that agricultural & tree biodiversity can contribute to improved nutrition, resilience, productivity and climate change adaptation. Through its E-Library, Bioversity International provides access to Training and self-learning materials on selected topics on the use and conservation of agricultural and forest biodiversity for a variety of audiences including researchers, technicians, university lecturers and policymakers. Many of the training packages include lecture support notes, exercises, notes for trainers, further reading, references, links and slides. Some materials are available in different languages. Here are the latest news from all CGIAR Research Centers. The Platform will also connect CGIAR with existing initiatives, for instance, the Global Agricultural Concept Scheme (GACS), FAO’s AIMS, CIARD, the Interest Group on Agricultural Data (IGAD) of the Research Data Alliance (RDA), and the Global Open Data in Agriculture and Nutrition (GODAN) initiative are of high importance and relevance.